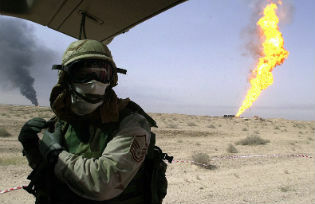 Oil has often been linked to interstate wars. Asymmetries in endowments of natural resources are important determinants of territorial conflict. When one country has oil near its border with an oil-less country, the probability of conflict is between three and four times as large as when neither country has oil. “These acts are tailored in a very systematic way by the Chinese side with the aim to turn undisputed areas into disputed areas”. Vietnamese spokeswoman Nguyen Phuong Nga, following the 9 June 2011 incident where a Chinese fishing boat rammed the survey cables of the PetroVietnam ship. The sea border dispute in the South China Sea is only the last of many historical cases where disputes and fear of conflict materialise exactly where oil is. Surprisingly, up to recently there has been very little systematic theoretical and empirical research on this topic. In this column we summarise the findings of the recent research (Caselli et al. 2013) on natural resources and interstate conflict and on the mechanisms through which asymmetric oil-field locations can fuel international turmoil. In public debates and in the historical literature natural resource abundance has often been linked to interstate wars. While there is plenty of talk about the role of natural resources in a few famous cases such as the Iran-Iraq war, Iraq’s invasion of Kuwait, and the Falklands war, this is only the tip of the iceberg. Many other historical examples of militarised interstate dispute seem to be about natural resources: Bolivia and Peru (Chaco War, oil, though subsequently not found), Nigeria and Cameroon (Bakassi peninsula, oil), Ecuador and Peru (Cordillera del Condor, oil and other minerals), Argentina and Uruguay (Rio de la Plata, minerals), Algeria and Morocco (Western Sahara, phosphate and possibly oil), Argentina and Chile (Beagle Channel, fisheries and oil), China and Vietnam (Paracel Islands, oil), Bolivia, Chile, and Peru (War of the Pacific, minerals and sea access), and many others. At the time of writing, militarised tensions involving territorial claims over areas known, or thought, to be mineral-rich exist in the South China Sea, the East China Sea, the border between Sudan and South Sudan, and several other locations. In many of these cases geographical resource asymmetry appears important, as violent border disputes seem far more likely when one of the conflict parties benefits from resource-rich territory close to the border, while its neighbour is relatively resource-poor. This pattern characterises many of the cases above. The literature on interstate wars in economics and in international relations has mostly emphasised the role of trade (e.g. Polachek 1980, Skaperdas and Syropoulos 2001, Martin et al. 2008, Rohner et al. 2013), domestic institutions (e.g. Maoz and Russett 1993; Conconi et al. 2012), development (e.g. Gartzke 2007, Gartzke and Rohner 2011), and stocks of weapons (Chassang and Padró i Miquel 2010). In contrast, the role of natural resources has been mostly studied in the context of civil wars and domestic governance. In particular, whether natural resource discoveries are to be considered windfalls or a curse for a given country is a subject of big debate (e.g. Mehlum et al. 2006 and Ploeg and Rohner 2012). Some scholars (e.g. Fearon and Laitin 2003, Besley and Persson 2009) argue that oil endowments are particularly important because they affect state capacity, while Morelli and Rohner (2013) show, theoretically and empirically, that even for civil wars oil matters a lot, when geographically concentrated in specific regions. In our recent paper “The geography of inter-state resource wars” (Caselli et al. 2013) we provide the first theoretical and empirical systematic analysis of the effects of the geography of oil endowments on interstate wars. The key idea of the paper is to relate the likelihood of conflict between two countries to the geographical location of natural-resource deposits vis-à-vis the two countries’ bilateral border. The reasoning is simple. Reaching, seizing, and holding on to areas belonging to another country is progressively more difficult and costly the further away these areas are from the border. The further an advancing army has to go, the more opportunities the defender has to stop the advance, the longer and more stretched the supply lines become, the greater the likelihood that the local population will be hostile, etc. Therefore, if countries do indeed engage in military confrontations in order to seize each other’s mineral reserves, as hypothesised in the case-study literature, they should be relatively more tempted when these reserves are located near the border. Accordingly, we ask whether countries are more likely to find themselves in conflict with countries with mineral deposits near the border than with countries with minerals far away from the border. The paper develops a simple but novel two-country model with a well-defined geography, where each country controls some portion of this geography, so there is a well-defined notion of a border, and where the two countries can engage in conflict to alter the location of the border. This provides a simple formalisation of territorial war. We use our model of territorial war to generate testable implications on the mapping from the geographical distribution of natural resources to the likelihood of conflict. We assume that each of the two countries may or may not have a resource deposit (henceforth oil, for short). The ones that have oil have the oil at a particular distance from the initial bilateral border. If a war leads one of the two countries to capture a portion of territory that includes an oil field, the control over the oil field shifts as well. Compared to the situation where neither country has oil, we show that the appearance of oil in one country tends to increase the likelihood of conflict. In particular, the heightened incentive of the resource-less country to seek conflict to capture the other’s oil, tends to dominate the reduced conflict incentive of the resource-rich country, which fears losing the oil. Similarly, ceteris paribus, the likelihood of conflict increases with the proximity of the oil to the border. As the oil moves towards the border the incentive of the oil-less country to fight increases more than the incentive for the oil-rich one is reduced. Finally, when both countries have oil, conflict is less likely than when only one does, but more likely than when there is no oil at all. More importantly, conditional on both countries having oil, the key geographic determinant of conflict is the oil fields’ asymmetric location. The more asymmetrically distributed the oil fields are vis-à-vis the border the more likely it is that two oil-rich countries will enter into conflict. The overall message is that asymmetries in endowments and location of natural resources are potentially important determinants of territorial conflict. The model’s predictions are tested using a novel dataset which, for each country pair with a common border (or whose coastlines are relative near each other), records the minimum distance of oil wells in each of the two countries from the international border (from the other country’s coastline), as well as episodes of conflict between the countries in the pair over the period since World War II. We find that indeed having oil in one or both countries of a country pair increases the average dispute risk relative to the baseline scenario of no oil. However, this effect depends massively on the geographical location of the oil. As shown in Figure 1, when only one country has oil, and this oil is very near the border, the probability of conflict is between three and four times as large as when neither country has oil. In contrast, when the oil is very far from the border, the probability of conflict is not significantly higher than in pairs with no oil. Similarly, when both countries have oil, the probability of conflict increases very markedly with the asymmetry in the two countries’ oil locations relative to the border. The results are robust to concerns of endogeneity of the location of the border, because they hold when focusing on subsamples of country pairs where the oil was discovered only after the border was set; in subsamples where the border looks “snaky,” and hence likely to follow physical markers such as mountain ridges and rivers; and in subsamples where the distance of the oil is measured as distance to a coastline rather than to a land border. They are also robust to controlling for a large host of country and country-pair characteristics often thought to affect the likelihood of conflict. Since country fixed effects are included, they are also robust to unobservable factors that may make individual countries more prone to engage in conflict. The theory applies equally, and the empirical methods could be usefully applied to, mineral natural resources other than oil. Acemoglu D, M Golosov, A Tsyvinski and P Yared (2012), “A Dynamic Theory of Resource Wars”, Quarterly Journal of Economics 127, 283-331. Besley, T and T Persson (2009), “The Origins of State Capacity: Property Rights, Taxation, and Politics”, The American Economic Review 99, 1218-1244. Caselli F, M Morelli and D Rohner (2013), “The Geography of Inter-State Resource Wars”, NBER Working Paper 18978. Chassang, S and G Padró i Miquel (2010), “Conflict and Deterrence under Strategic Risk,” Quarterly Journal of Economics 125, 1821-1858. Collier, P and A Hoeffler (2004), “Greed and Grievance in Civil War”, Oxford Economic Papers 56: 563-95. Conconi P, N Sahuguet and M Zanardi (2012), “Democratic Peace and Electoral Accountability”, mimeo, Université Libre de Bruxelles. Fearon, J and D Laitin (2003), “Ethnicity, Insurgency, and Civil War,” American Political Science Review 97: 75-90. Gartzke, E (2007), “The Capitalist Peace”, American Journal of Political Science 51, 166-91. Gartzke, E, and D Rohner (2011), “The Political Economy of Imperialism, Decolonization, and Development”, British Journal of Political Science, 41, 525-556. Maoz, Z and B Russett (1993), “Normative and Structural Causes of Democratic Peace, 1946-1986”, American Political Science Review 87, 624-38. Martin P, T Mayer and M Thoenig (2008), “Make Trade not War?”, Review of Economic Studies 75, 865-900. Mehlum H, K Moene and R Torvik (2006), “Institutions and the Resource Curse”, Economic Journal 116: 1-20. Morelli, M and D Rohner (2013), “Resource Concentration and Civil Wars”, Working Paper 13.08, Department of Economics, University of Lausanne. Polachek, S (1980), “Conflict and Trade”, Journal of Conflict Resolution 24, 55-78. Rohner D, M Thoenig and F Zilibotti (2013), “War Signals: A Theory of Trade, Trust and Conflict”, Review of Economic Studies, forthcoming. Skaperdas, S and C Syropoulos (2001), “Guns, Butter, and Openness: On the Relationship between Security and Trade”, The American Economic Review 91, 353-357. Van der Ploeg, F van der, and D Rohner, 2012, “War and Natural Resource Exploitation,” European Economic Review 56: 1714-1729.